North American session sold into the dollar's upticks and Asia followed suit, taking the greenback to new multi-year lows against the euro and sterling while pushing it below the JPY110 level for the first time since last September. US trade action has become latest element of the narrative the seeks to explain the dollar's slide and the decoupling of the greenback from interest rates. The euro reached a high in European turnover above $1.2350 and sterling pushed through $1.4100. 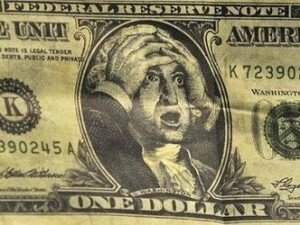 The dollar eased to almost JPY109.50. The Australian dollar, which narrowly avoided an outside down day yesterday was bid through last week's high of $0.8040. Similarly, the US dollar slipped below last week's low near CAD1.2370. At Davos, US Treasury Secretary Mnuchin provided the incentives in the European morning to continue to push the greenback lower. He expressed no concern for the recent slide and noted that a weaker dollar is "good for us as it relates to trade and opportunities." The price action brings new option strikes into view. There is a little more than $500 mln on a JPY109.20 strike that will be cut in NY today and another $400 mln near JPY110.80. Tomorrow, there is roughly $2.4 bln of options struck at JPY110.00-JPY110.05 that expire. Today, there is also an option struck at $1.23 for 640 mln euros and 1 bln euros of options struck between $1.2250 and $1.2275 that expire. There are two broad explanatory models of currency movement that seem to be prevalent among investors. The first focuses on the relative price of capital (interest rate differentials) and the trajectory of monetary policy. The second focuses on external imbalances (trade and current account). The seeming decoupling of the US dollar from the movement of interest rates has seen greater emphasis placed on the latter. The tariffs the US has imposed on solar panels and washing machines draws attention to the deterioration of the US trade balance. We too have noted that despite the striking improvement of the US energy trade balance, there has been notable deterioration of the non-oil balance. Yet, it seemed that the capital flows were sufficient to offset it, and the broader current account deficit, as a percentage of GDP has been fairly steady over the last few years near 2.4% of GDP, which is less than half the size of the pre-crisis levels. The incentives provided in the recent tax bill for companies to repatriate overseas earnings likely heralds a dramatic improvement in the US current account balance. The lion's share of the earnings that have been retained abroad is already in dollar-denominated investments, according to various accounts and reports. However, when it is brought back into the US, it is picked up in the current account measure of investment income and will offset part of the trade deficit. The sanctions that the US imposed on solar panels was slightly less than sought by the US-based Internationa Trade Commission. And both the solar panel and washing machine actions were seen as narrow and limited rather than broad and disruptive. There are other issues pending--steel, aluminum, and intellectual property. China's response is still awaited. It has complained, of course, but in 2011, the last time the US imposed tariffs on solar panels, China retaliated against importing US-sourced polysilicon that is used to make the panels. It is not clear if or how China will respond. Japan reported its December trade balance earlier today. Seasonal factors make the December surplus almost always larger than the November balance and last year was no exception. The unadjusted trade surplus was a little more than three times the November surplus (JPY359 bln vs. JPY113.4 bln), but exports were weaker than expect and imports stronger. The rising yen may have weighed on Japanese equities. The Nikkei fell about 0.75%, its largest decline since early last month. Most sectors were lower, though real estate and telecom sectors posted minor gains. The Topix lost a more modest 0.5%. It had experienced larger losses last week. Taiwan's 0.9% loss was the largest in the region. Of note, Chinese shares continue their streak. The Shanghai Composite rose about 0.4%. It has only fallen once so far this year and that was on January 15. The H-shares that trade in Hong Kong and are tracked by the Hong Kong Enterprise Index rose for the 19th consecutive session today. The flash EMU PMI readings showed unexpected weakness in manufacturing and increased strength in the service sector. The German manufacturing PMI eased to a still lofty 61.2 from 63.0. France's reading slipped to 58.1 from 58.8. The service PMI rose to 57.0 from 55.8 and to 59.3 from 59.1 for Germany and France respectively. The composite reading edged lower in Germany to 58.8 from 58.9. In France, the composite ticked up to 59.7 from 59.6. UK employment data was largely in line with expectations. The claimant count rose 8.6k in December after having risen an average of 7.2k over the previous three months. The November unemployment rate was unchanged at 4.3%, while average earnings, including bonuses, rose at a 2.5% pace, the same as in October. Excluding bonuses, average weekly earnings ticked up to 2.4% from 2.3%. However, residual strength was seen in the employment growth, which rose to 102k (3m/3m) after weakness was seen in August through October period. This pattern was born out in the aggregate readings for the eurozone. Manufacturing slipped but was offset by the gains in the service sector, and the composite made new cyclical highs. The softness in manufacturing may be a reflection of the euro's strength, while the improved service sector readings suggest the domestic economy may be picking up whatever slack has been created. Oil prices are little changed as the market turns cautious ahead of the EIA report today. Yesterday, the US API estimated that oil inventories rose 4.76 mln barrels, the first increase in 10-weeks. The median forecast in the Bloomberg survey is for the EIA measure to fall by two million barrels. The concern is that the higher prices, and yesterday the WTI contract for March delivery closed at its highest level since December 2014, will spur a faster increase in US output. In the US, Markit will release its preliminary PMI readings and the National Association of Realtors report existing home sales for December. Existing home sales rose a heady 5.6% in November and there will likely be payback in December. Existing home sales are expected to have fallen by nearly 2%. The new tax changes are thought to be a headwind alongside rising mortgage rates. The FOMC meets next week and no change in policy is expected. It will be Yellen's last meeting as chair. Nominee Goodfriend held his own in the confirmation hearings, and while he endorsed the current course, his answers seem to place him among the (relative) hawks at the Fed. Lastly, although there has been some concern about central banks diversifying away from Treasuries, and the latest TIC data showed the two largest foreign holders, China and Japan, paring holdings, demand at the Treasury's auctions have been strong. Yesterday's $26 bln two-year note sale was well received. The 3.22 bid-cover was the strongest in more than two years. Indirect bidders, which includes some asset managers and central banks, grabbed 58.3%, the most since last July Primary dealers took down 25.8% compared with a recent average of nearly 35%. Today the government sells two-year floating rate obligations and five-year conventional notes. Next week, Treasury will announce the details of its quarterly refunding and has put investors on notice to be prepared for larger coupon sales.